Andravida (also called the Eleia, Ilia, or Greek) horses are a rare light draft breed found in the region of Ilia, Greece. Andravidas are predominantly brown, bay, chestnut, red roan, black and occasionally grey. The head is rectangular in shape and plain with long ears and a straight profile. The chest is broad and heavy-set with thick muscles; the back is slightly dipped. Their temperament is described as willing but strong. They are of moderate height ranging between 14 to 16 hands (56 to 64 inches, 142 to 163 cm) high with the average being at around 15 hands (60 inches, 152 cm). 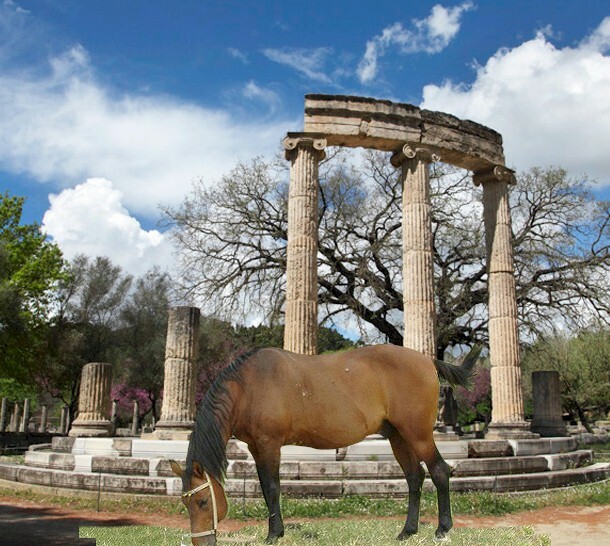 The ancestors of the Andravida horses were said to be used as cavalry horses by the Athenians in the 4th century BC as well as war horses by the Greek in the7th century. During the 13th to 15th centuries Arabian blood was used to refine the stock. Anglo-Norman horses were used for improving the breed, but it gradually began to decline and was revived only in the early part of 1990s. An Andravida stud sired around 50 healthy colts which were sent to breeders throughout Greece. This one animal may have saved the breed from extinction and became the foundation for the official studbook established in 1995. Their numbers remain very low; they are rarely found anywhere outside of Ilia.